All of the fabulous stencils pictured above were featured in ELLE Decoration, SA Edition, and are free for personal use. Follow the links to download the patterns in PDF format. 1) Use Tracy Lynch’s lovely silhouettes of glass and cutlery to stencil a wall in your kitchen or dining area. PDF download available here. 2) Also from Tracy Lynch, old-fashioned hand mirrors make a clever display when stenciled on a bathroom wall and used to frame real mirrors. 3) Artist Conrad Botes used animal stencils to decorate his daughter’s room. Download his adorable poodle stencil, here. 4) A collection of old drawers functions as a unique bathroom cabinet with the help of clamps and these stencil designs from Tracy Lynch. Download stencil patterns for each of these projects as pdfs from ELLE Decoration. 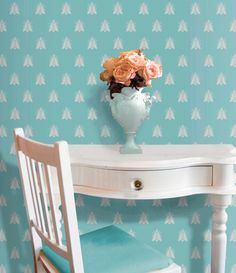 For even more free stencils, try following our Free Stencil Patterns board on Pinterest.